This collection of healthy granola recipes includes homemade granola bars, bites, and breakfast cereal. 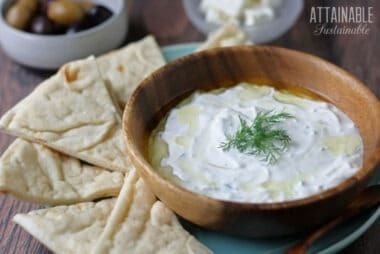 Making these healthy snacks at home is not difficult and allows you to customize the ingredients to suit your taste buds. Plus? It will save you some serious cash at the checkout stand. The hardest part will be deciding what to make first! 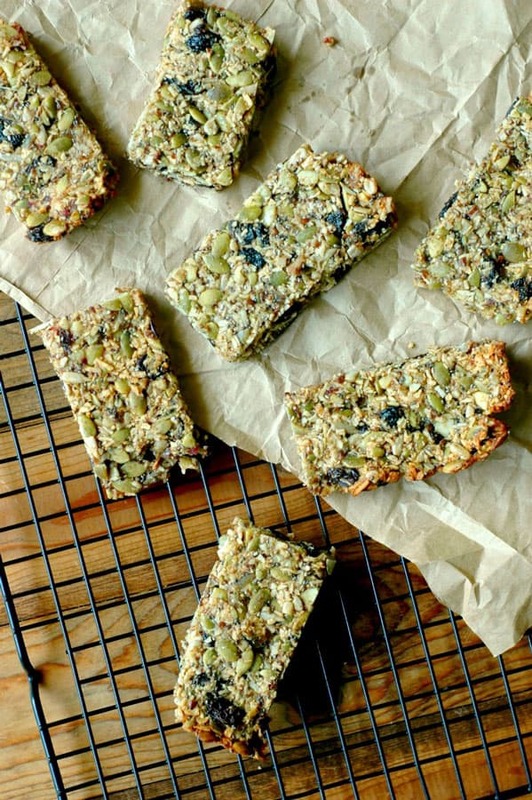 Granola bars are a great snack for busy days when families are on the go (hey, Little League season!) or for taking along on longer excursions. Whether you’re planning for a camping trip, taking a plane ride, or heading out on a long road trip, they’re a healthy way to fill the hunger void. The trouble with store-bought granola bars? They’re expensive at a couple bucks a pop. They come packaged in individual wrappers that will end up in the trash. Not all of them are as healthy as the label would have you believe. Happily, these healthy granola recipes are easy to make at home! Below you’ll find everything you need to start making these snacks at home. I’ve gathered recipes for a variety of basic granola bars, as well as homemade granola bars that are gluten-free, Paleo, and raw. There’s even a section that includes breakfast cookies. There’s some overlap on this collection of recipes. Some of the breakfast cookies are paleo. Many of the paleo granola bar recipes are also gluten free. 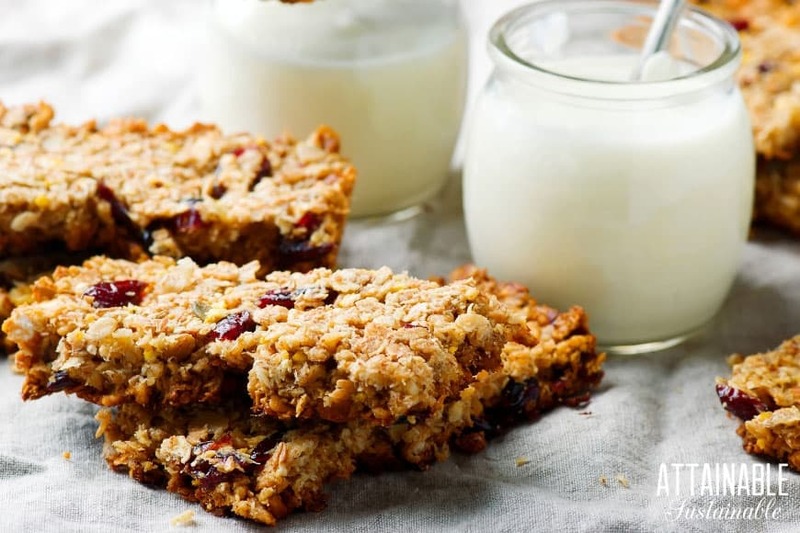 No matter which one(s) you choose to try, with these recipes, you’ll be able to replace those store-bought snacks and make the switch to making healthy homemade granola bars at home. Most kitchens are equipped with the gear you’ll need for making healthy homemade granola recipes, but there are a few things that will make your granola bar-making easier. 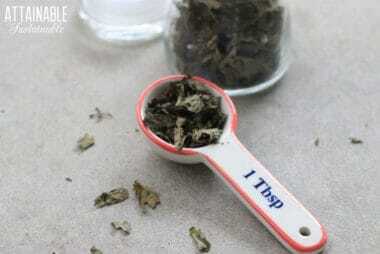 Food processor: This is a must for many of the raw recipes included here, as you’ll need to grind nuts and seeds into a fine grind. Scoop: While not necessary for making energy bites, a cookie scoop can help keep the balls uniform as you make them. Silicone baking mat: I’m a big fan of these baking mats, as they prevent sticking and eliminate the need for the disposable parchment paper called for in some recipes. If you’re switching to homemade granola bars in part because you’d like to create less waste, you’ll want to take that into consideration when you pack these to go. Reusable snack bags are easy to make at home. If you’re not up for making your own, try these. These stainless steel snack boxes are a bit expensive, but they are durable and will last almost forever. This set of three round containers will work for breakfast cookies. Whether you add it to yogurt or serve it with milk, you’ll want to keep your homemade granola in an air-tight container to preserve freshness. 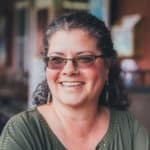 I’m a fan of 1/2 gallon canning jars for this, but there are a number of other pantry storage options here that will work, too. The standard granola bar recipe requires mixing healthy ingredients and pressing them into a pan or tray for baking. Cut them into squares or rectangles once they’re baked and you’re ready to snack. Most granola bar recipes freeze well, too. 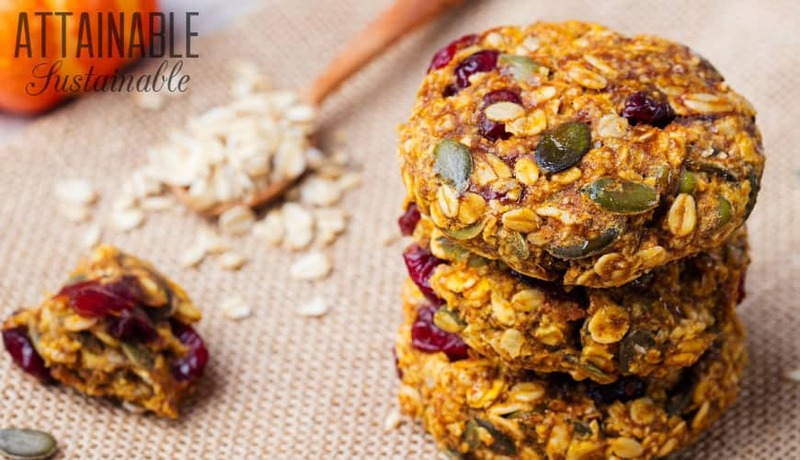 No-bake, raw homemade granola bars and healthy energy bite recipes don’t require any baking, making them a great option for summertime snacks. No need to turn the oven on and warm the house up to pull these recipes together. 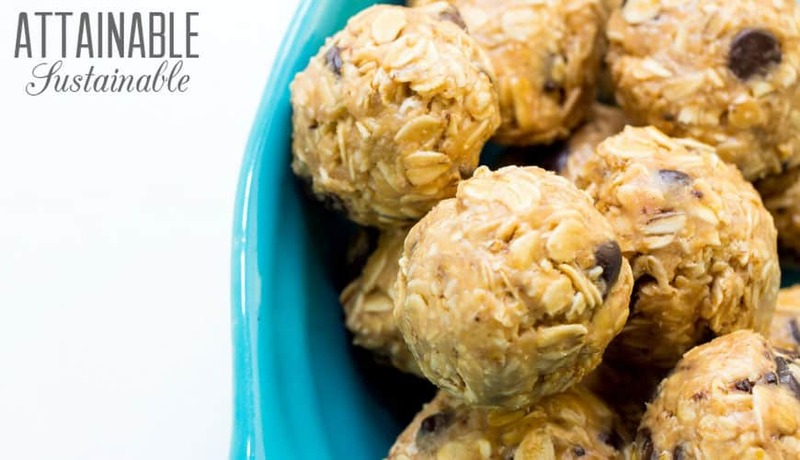 Some of these recipes are pressed into a tray and cut into bar shapes; others require rolling into balls for a bite-sized energy boost. These grain-free granola bar recipes work for those who are sticking to special diets like Whole 30 or aiming for a lectin- or gluten-free diet. Double check the ingredients for these granola recipes to make sure that these fit your healthy eating plan. Cookies for breakfast? Sounds indulgent, but similar to a granola bar recipe, these cookies feature healthy ingredients and less sugar than your average cookie. They take a bit more effort than making granola bars, but they’re a tasty and healthy alternative to baked granola bars. Most store bought cereal is full of ingredients that don’t exactly fit with a wholesome eating plan. And goodness, they’re expensive! 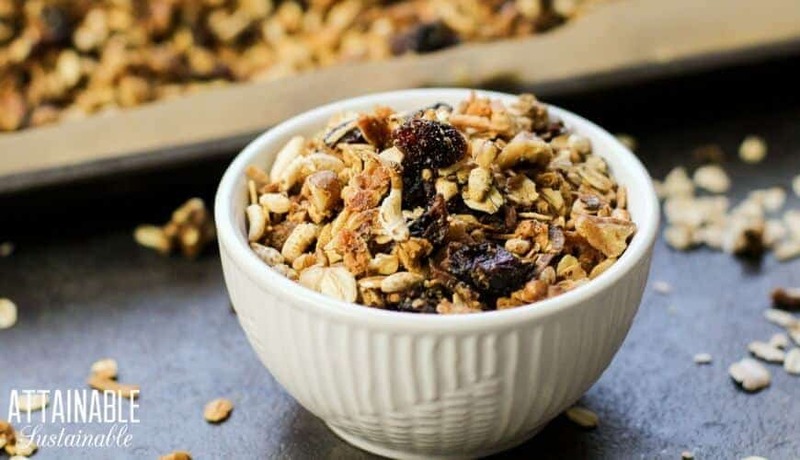 Try some of these healthy granola recipes for making your own breakfast cereal at home.